Is a Business Liable for Negligent Acts Committed by Its Subcontractors? One of the key principles of Tennessee personal injury law is that a “principal” is legally liable for the negligent acts of their “agent.” For example, if a salesperson is traveling to visit a customer in her company-owned car, runs a red light, and plows into a minivan, the latter vehicle’s occupants can sue the salesperson’s employer for damages. This is because the salesperson was an “agent” of the employer (the “principal”). More importantly, the agent was “acting on the principal’s business and acting within the scope of her employment” when the accident occurred. It is more difficult to establish an employer’s liability, however, if the alleged agent is classified as an “independent contractor” rather than an employee. In many cases, a business is not responsible for the acts of third parties–or the third party’s employees–who are contracted to perform certain services for the company. Of course, the third party may still be responsible for the actions of its own employees. A recent decision by the Tennessee Court of Appeals, Mack v. Comcast Corporation, illustrates the complexity of sorting out agency relationships. This case arose from an unusual set of circumstances. The plaintiffs are a married couple living in Shelby County. They allegedly failed to pay their Internet service bill. This prompted an attempt to “retrieve a modem” allegedly owned by the local Internet provider, a subsidiary of Comcast, after the company disconnected the plaintiffs’ service. Comcast actually contracted a third-party company to handle these tasks. A subcontractor of the third party subsequently visited the plaintiffs’ home in an attempt to reclaim the modem. The husband warned the subcontractor not to enter his home. This led to a “physical confrontation,” according to Comcast. At one point, the subcontractor claimed the husband assaulted him with a shovel. The husband said he only grabbed the shovel “to compel [the subcontractor] to leave the residence” but never actually attacked him. Local police arrived at the scene and arrested the husband. Although criminal charges were later dropped, the husband said he lost his job due to the publicity surrounding his arrest. The courts agreed. As the Court of Appeals explained, the business manager for the third-party company submitted an affidavit explaining in detail the relationship between her firm and Comcast. Essentially, the third party had “full discretion in how it went about conducting equipment retrieval efforts” and in turn it granted individual subcontractors the right to “organize and operate their retrieval effort as they saw fit.” Indeed, the plaintiffs’ own court filings acknowledged the individuals responsible for their alleged injuries were working as “independent contractors” at the time. Given this, there was no legal basis to hold Comcast or its subsidiaries liable for any injuries sustained by the plaintiffs. Sorting out who is responsible for a specific personal injury claim often requires a good deal of pre-trial investigation. This is why it is important to work with an experienced Knoxville personal injury attorney who can offer you professional advice and assistance. 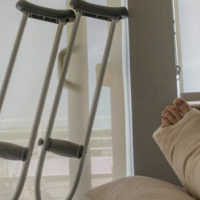 If you have been injured due to someone else’s negligence, contact the offices of Fox & Farley, Attorneys at Law, today.